I told J that we very appropriately nicknamed our little baby-to-be, “Tater” as carby foods seem to be what she has me craving most of the time. Whether it’s tacos, burgers, pizza, chips, etc. the carbs are what taste and settle the best most days. Carbs and salads, oddly enough. So, what could be a better combination than a crispy taco with slaw on it?? Carbs and a salad-like substance all in each glorious taco bite! 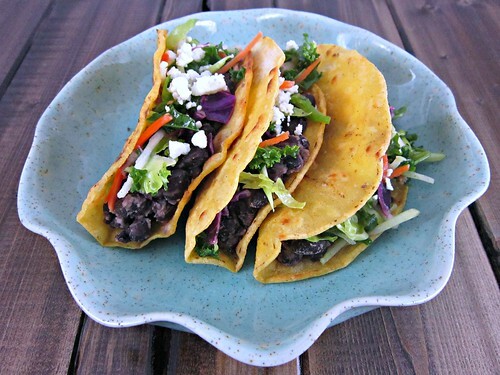 I first saw these glorious tacos on my dear friend Sarah’s blog, A Taste of Home Cooking, and I was immediately drawn to them. I probably had the recipe saved for a year or more, hesitant to make them because even though black beans are a protein, J wants/needs the protein in meat for every meal so it was going to be risky to try to pass these off as a full meal to him. Eventually though, I just had to try it. I figured if he ate enough of them, he’d get enough protein, right?? Fortunately he ate them up without complaint. And that slaw was a might tasty addition, for sure. It took me a few tries to get the tortilla flipping down, but once I did, it was easy peasy and I couldn’t wait to put the tacos together and devour them!! Place the beans, cumin, and salt and pepper to taste in a bowl and partially mash with a fork. In another bowl, toss the broccoli slaw mix with olive oil, lime juice, scallions and cilantro. Season to taste with salt and pepper, and set aside. Pour enough olive oil in the bottom of a large nonstick skillet to just cover the bottom (not a thick layer) and heat over medium-high heat. Add as many tortillas as you can fit in a single layer. Move the tortillas around in the pan so they’re all evenly coated with oil on both sides. After one side is golden brown, flip the tortillas over and spoon 1/4 cup or so of the bean mixture onto one half of each tortilla. Cook for about 1 minute. Fold the tacos in half and cook until golden brown and crispy, 1-2 minutes per side. Remove the tacos to a paper towel-lined plate and drain off any excess oil. 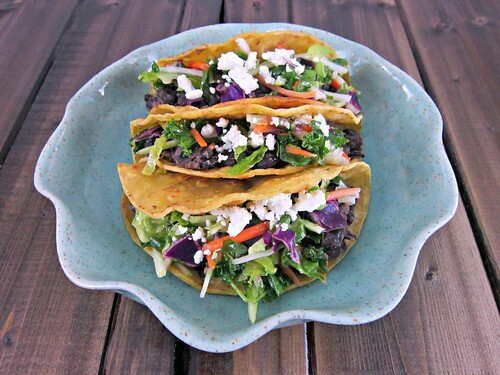 Spoon slaw into each taco and topped with crumbled feta. Serve with hot sauce, if desired, and enjoy!